Some of the 70 lbs of daffodil bulbs vacationing in Missouri from my brother's Virginia garden. I plant them now! I can't wait until next year, the daffodil bulbs are already starting to grow, which means they are using the energy stored in the bulbs. If I wait, they will grow and die because they can't repurpose soil nutrients into stored food without being in soil. As long as the soil isn't frozen, those of us who live in USDA Hardiness zone 5b can continue to plant, if we don't mind being out in cold weather. Bulbs, shrubs, trees can all be settled in this time of year. You can also move some perennials but I prefer to wait until spring, or when they are just starting to grow to do that in most cases. I don't always remember what I planted in a spot. Chances are good if I dig someplace, the spot is already occupied. Some of the daffodils cut out of my garden last year, love their sunny disposition! Love for the sunny daffodils runs in our family, I have a hillside full of them. One of my neighbors used to call my garden "daffodil land." I have them scattered in places where they can expand on their own - it's called naturalizing - and they aren't missed when I sneak out to pick a few! For my brother's daffodil bulbs, I have them in a large flower bed planted in rows so they can easily be dug up later. I also have some at the corner of a path I can see from my living room window so I can enjoy them when they finally bloom. It could be a couple of years before the bulbs have enough energy but that's okay, they are worth the wait. I have some yellow roses that can add a splash of sunshine in the garden in the meantime. 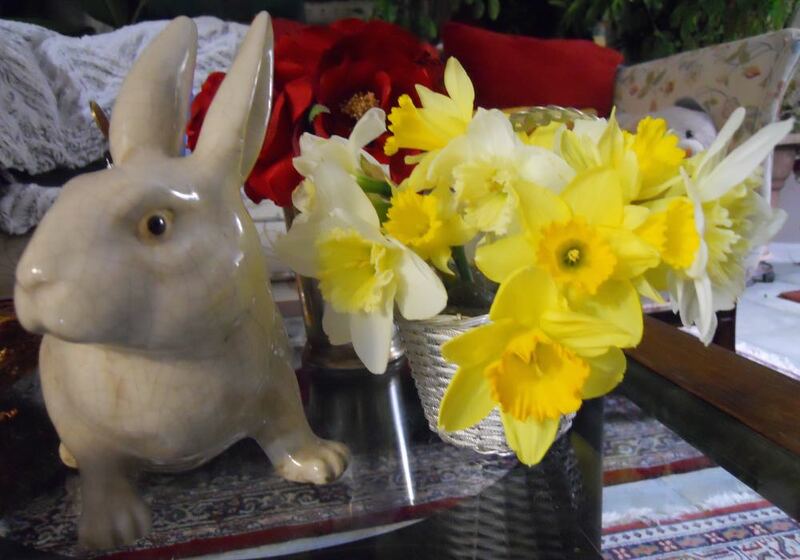 Do you have daffodils in your garden?